Women don't learn as easily, he says, because they "are not accustomed to taking regular exercise," and, he adds, "they want to play golf the way they play croquet". (yes... croquet... that's what he said.) "Women don't use their arms," he continued, "they have no use for them above the elbow. That makes it hard for them to learn golf". If this sounds a bit "off" to you... and I really hope it does... it's because it was written in 1898. I came across it today in the archives of The New York Times. As much as I was turned off by the article's casual acceptance of the limits imposed on women, I've got to admit I was a tiny bit... charmed... by its quaint language and the picture it painted of a society far more naive and innocent than ours. 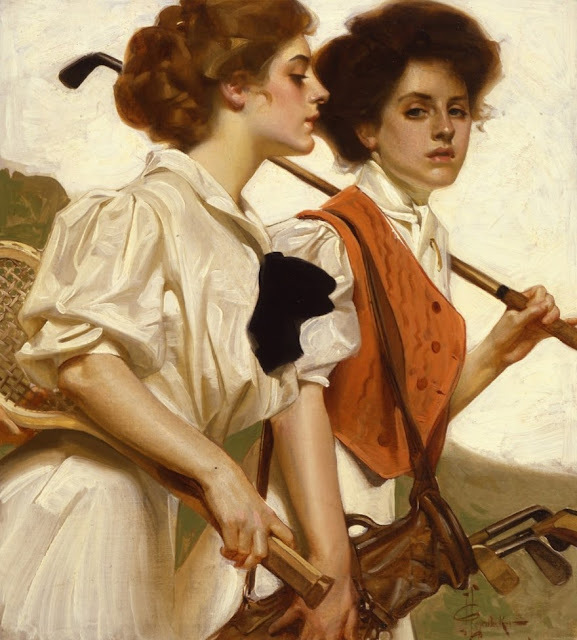 The piece is about a group of girls taking golf lessons during winter in a gymnasium. It talks about "exciting times in which the balls are flying around the big hall in such gay fashion on these cold Winter days". (gay had only one meaning back then, and it wasn't the one most common today). In speaking about the small carpeted putting surfaces, the writer explains to his 19th-century readers that, "though indoor golf may not sound very attractive, with a club once in hand, a putting green has a fascination not to be withstood." Not that I'd ever want live in that era, but I like reading about it, and sometimes it even inspires me to act more ladylike...for a couple of minutes.